Years ago, some people tended to shun eggs for fear they'd raise one's cholesterol. Lots of kosher bakeries turned out so-called "water challahs" to cater to the egg abstainers. Some people still do avoid eggs, but as nutrition science advanced, the egg was vindicated, and for many, the water challah was forgotten. It seems blasphemous to make an egg bread (another name for challah) without eggs, but if you're out of eggs or vegan, this recipe produces a spectacular and delicious result. The dough rises beautifully and is easy to work with. Crusty, chewy, and a bit sweet, this recipe will become your go-to challah—even though there probably won't be any leftovers for French toast. Place the warm water in a large bowl or stand mixer. Add a pinch of the sugar to the bowl, and sprinkle with the yeast. Set aside in a warm place for 5 to 10 minutes, until the mixture is foamy. (If your yeast doesn't proof properly, discard the mixture and start again with fresh yeast). Turn the dough out onto a lightly floured work surface. With clean, floured hands, knead the dough until it is smooth and elastic, about 5 to 10 minutes. Allow the dough to rest for a few minutes while you clean and dry the large mixing bowl. Grease the inside of the bowl with a bit of oil. Place the challah dough in the bowl and turn to coat with the oil. Cover the bowl with a damp tea towel or plastic wrap and set aside in a warm place until the dough has risen to at least double its bulk, about 1 hour and 45 minutes. 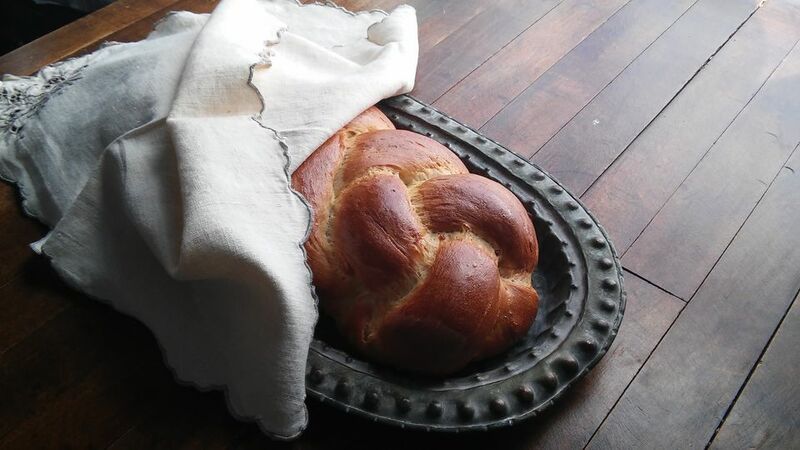 Place the shaped challah and/or rolls on the baking sheet(s) and cover with clean, dry tea towels. Allow to rise until doubled, about 45 minutes to 1 hour. Heat the oven to 350 F. While the oven is heating, make the maple wash by whisking together the maple syrup and soy milk. Brush over the challah with a pastry brush. Bake the challah until the crust is a deep golden brown, and the loaf sounds hollow when tapped, about 30 to 35 minutes for a large challah, 20 to 25 minutes for a medium challah, and 15 to 20 minutes for rolls. Cool on a wire rack. Place the ingredients in the bread machine in the order recommended by the manufacturer. Select "Dough Cycle." When the cycle ends, remove the dough from the machine. Shape as desired and transfer to prepared baking pans. Allow the challah to rise, covered lightly with a clean, slightly damp tea towel, for 30 minutes to an hour, or until doubled in size. Brush with the maple mixture. Bake in a heated 350 F oven until the crust is golden, and the loaf sounds hollow when tapped, about 30 to 35 minutes for a large challah, 20 to 25 minutes for a medium challah, and 15 to 20 minutes for rolls. Cool on a wire rack.